So, I went to the Asian market the other day to buy some stuff. A squirt gun to piss off my cats, some lottery tickets, a basketball and the old Fiat X 1/9 wheels in the window was on my shopping list. Then I started thinking about food. I like banjo music a lot, so I grabbed cans randomly in two different aisles. Most of the stuff was vaguely fish-related, as were a couple of dozen bottles of assorted sauces and magical powders. 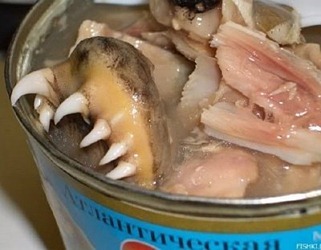 This stuff is considered a delicacy in parts of Eastern Europe. It's actually rather tasty, and you can utilise the teeth to carry out cola-related experiments. Tasty *and* practical! Sir Harry, you are a font of disinformation, the likes of which I have never smelt, nor dealt. Cheers!